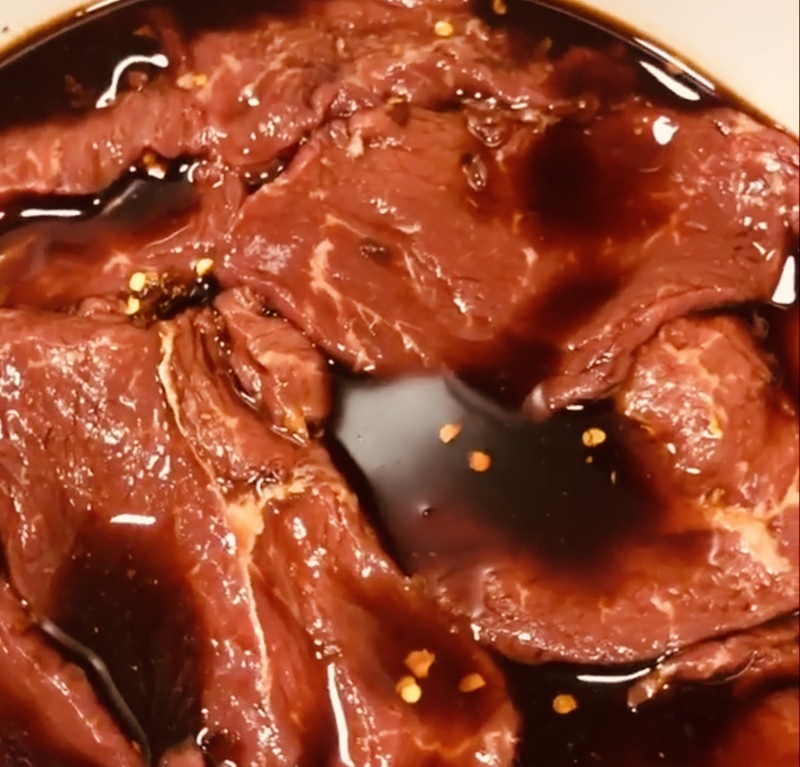 A few years ago I saw a cook on some cooking show marinating strips of beef fillet in a sauce of cider and soy sauce to cook them for several hours in a sous vide. I found the combination of ingredients interesting, but I wanted to make a marinade for the barbecue. Here is the recipe. The following ingredients and quantities refer to 1 kg of steak meat. Cut the steak meat, if not yet done, into 3cm thick steaks. Mix the marinade in a flat bowl. First pour the cider into the bowl, then the soy sauce and immediately afterwards the brown sugar. Mix all three ingredients carefully for about 5 minutes. The sugar will probably not dissolve completely, that is not a problem. Finally add the Makers Mark Bourbon Whisky. I particularly recommend this whisky because it rounds off the recipe perfectly with what I call its "cookie dough aroma". Finally, season to taste with the chilli flakes. Don't worry, even with a larger amount of chilli, the marinade won't get too hot because of the remaining ingredients, so don't use the chilli flakes too sparingly. Now stir the marinade again properly, then put the steaks in the bowl and make sure that both the top and bottom of the steaks are wetted. Let the steaks steep in the marinade for a total of 3 hours. After 1.5 hours we turn the steaks in the bowl to make sure that both sides come into propper contact with the marinade. Also after turning the steaks, wet the tops again with the marinade. Store the steaks at a cool cellar temperature or in the refrigerator during the marinade time. After a total of 3 hours of marinade time, fry or grill the steaks on each side for approx. 2.5 minutes, then let them rest for 3 minutes at 150 degrees off the heat and serve. I personally use a Weber kettle grill for cooking on the flame and the resting place for the meat in the middle of the grill.